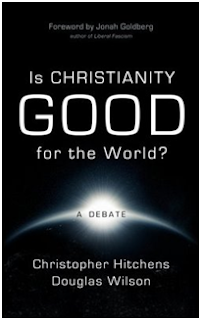 Is Christianity Good for the World? is a written debate between Christopher Hitchens and Douglas Wilson. This debated was hosted originally by Christianity Today and then published in book form by Canon Press. It is, in short (and it is short) a fascinating read. At a quick 67 pages, it should take no more than an hour of actual reading time. However, your thought processes following the reader may take up a bit more time than that. I really don't want to engage in any sort of debate on my site here as to whether or not Christianity is good for the world. If you check out my archives, you can gather my answer easily enough. I am what I am without apology. I am curious to hear how other people view of Christianity though. Years ago I read a fabulous book by Betrand Russell entitled Why I Am Not a Christian that was tremendously eye-opening for me in helping to understand what it is that Christians do to get the gospel so wrong. Sure, we're sinners and we mess up constantly. We can't help that. It's our basic nature. However, we are saved by grace and we also realize that. No one is perfect. I wouldn't want to even try to pretend to be. While I know I am forgiven my faults, I also cannot ignore the fact that my actions/attitudes/thoughts have consequences to the people in the world around me. The things I say can and often does effect their emotions. That's another fact I can't escape. So understanding how a non-believer would translate a statement/action/attitude of a Christian is helpful as I try to eliminate making as many mistakes as possible. I won't ever succeed fully as my basic belief is basically offensive to some. However, I can try. I should try. I do try. I find that completely and utterly fascinating. He simultaneously rejects forgiveness for both himself and for anyone else. He makes a bold statement that to forgive is "suicidal". And aren't I so glad for it!?! To forgive is the worst and hardest thing to do. He almost suggests its an easy and pleasing thing to do. Oh no, Mr. Hitchens. It is the most awful thing ever sometimes. Sometimes the idea of forgiveness is enough to drive a person mad. But again - aren't we thankful for it? It isn't easy. It is painful. But it is healthy and we live in forgiveness and then should turn around and let others live with the same peace of mind. Is Christianity good for the world? Is forgiveness? fabulous post....it brought tears to my eyes...so thankful for the forgiveness I've been given! Great review, Carrie. This book does sound like an interesting read. And I agree that it's very important for us, as Christians, to understand how others (non-Christians) view Christianity so that we can better be God's light. Sounds very interesting; I'm putting it on my list! That does sound like an interesting read. Sounds like the author may be a little confused about what confusion is though. I don't think it means we let dangerous people walk free in society to hurt others, it's something that happens in our hearts, separate from any justice system. It's something that is more for us and our relationship with God, than it is for the offender. I'll have to give it a closer look. Great post, Carrie. I was amazed and perplexed when my next-door neighbors told me that they could not accept Christianity because of God's forgiveness. How could God let a murderer get off "scott free"? they wanted to know. When we tried to explain they shut us right off. I hadn't known that grace could be a deterrent to belief.